The words were like bitter candies that I had been sucking on, hoping to come to a sweet center. I had walked the hallways of the hospital holding them in the silky pocket of my cheek for weeks. Finally, afraid I would choke, I spit them out into the middle of the dinner table. Led by Julie Silver MD, Harvard Medical School offers a 3-day course on Writing, Publishing, and Social Media for Healthcare Professionals each spring in Boston. The course offers insights on maximizing communication, building a personal platform, improving your writing, the process of publishing, and opportunities to connect with other healthcare professionals as well as editors and literary agents. I attended this past weekend and had such a great experience that I am compelled to share my top take-home messages, in no particular order. A recent article written by Dr. Karen Sibert was shared via social media, intending to help women avoid harassment in medicine. Unfortunately, although it was well-intended, the content was questionable. Written by a woman who reportedly went through training when medicine was skewed very heavily toward the male gender, and who has raised two daughters, there are clear lessons to be learned from her path. However, the tips included in the article stray from the leading message of female empowerment. Here, I’ll deconstruct Dr. Sibert’s tips and add my own perspective to hopefully make them more relevant to women in medicine today. You might say that words don’t make a difference. In some ways, you’re right. But there’s a funny thing about words – they hold magic and power. They have the ability to bring things to life. And this is exactly what the #MeToo movement is doing. My career in medicine is something I am proud of. I was the first one in the family to enter the field of medicine, and I have navigated the maze of my medical education and training often blindly, without footsteps to follow. I have built a career in which I am both passionate and successful. From the outside, it is an incredible accomplishment. But it has not been without sacrifice – and those sacrifices have impacted everyone who loves me. Surviving in Medicine: Find Your Person. A while back, I had a really rough week at the hospital. It was a combination of many things: lack of sleep, working at a site away from home, and a string of very sick patients that culminated in one of the hardest patient deaths I’ve had to handle so far in my career. I happened to mention some of this in casual conversation with a family member and it stopped them dead in their tracks. “How do you do it?” they asked. Her name rolled around in my mouth like a smooth marble. It was the kind of name you don’t hear much anymore. Then, I looked at her birthday on her patient information sticker. The year was the nineteen twenties. It made me think back to the days of roaring twenties, flappers and the Great Depression. But in her case, it was real depression that brought her to me. I grew up wanting to know about the world. When I was only three years old, I asked my parents for a globe for Christmas. My mom said I was so happy when I opened it, I sat hugging the globe in my lap while I ate chocolate out of my stocking. My love for the world hasn't diminished over the years - in fact, I think it probably has grown. I've had the opportunity to travel to many places, some developed and some extremely impoverished. My experiences with other cultures have shaped me into the person and the physician that I am today. Travel broadens your horizons. It opens your mind in places that you may have not even know it was closed. It makes you a better person, if you let it. It is because of my view of the world, rather than despite it, that I chose to get my medical education at St. George’s University in the Caribbean. I remember sitting down with a highlighter and a big book of all the medical schools in the US, along with my MCAT scores and my CV when it was time to start applying to medical school. And after going through that whole big book of schools, only one stood out to me – and it was that admissions committee that received my one and only application to medical school. “Why a foreign medical school?” you might ask. And you would be right to question - because it is no little known fact that there is still a stigma surrounding foreign medical grads. Caribbean schools are seen as a “last-shot” for some, in particular those who have been unable to gain admission to US medical schools. It is historically more difficult to obtain electives and even residency slots as a foreign grad. In that same vein, non-traditional applicants outnumber those coming straight from college. But these reasons did not deter me – in fact, they were among the reasons why I chose SGU. I wanted to study with those who were hungry, with those who knew what it was like to have to work for their dreams, and to succeed because they chased that passion relentlessly. My MCAT scores were competitive, I had extensive healthcare experience, and my CV exemplified my well-rounded upbringing. SGU was not a last-chance choice for me – it was my first choice. And, given the opportunity, I would choose it again. The Keith B. Taylor Global Scholars Program welcomed me into a group of pre-meds who shared my passion for global health. Together, we experienced life “across the pond” in between cadaver lab, exams, and lectures on global health. I ended my first year with a trip to Kenya on a Tropical Medicine elective, which only emphasized that I had made the perfect choice in SGU. My second year found me on the island of Grenada, where in between practice patient encounters, I had real patient encounters in the local hospitals. The exposure to the pathology there, in combination with the limited resources, was a lesson in doing more with less, something that I have carried with me through my medical career. 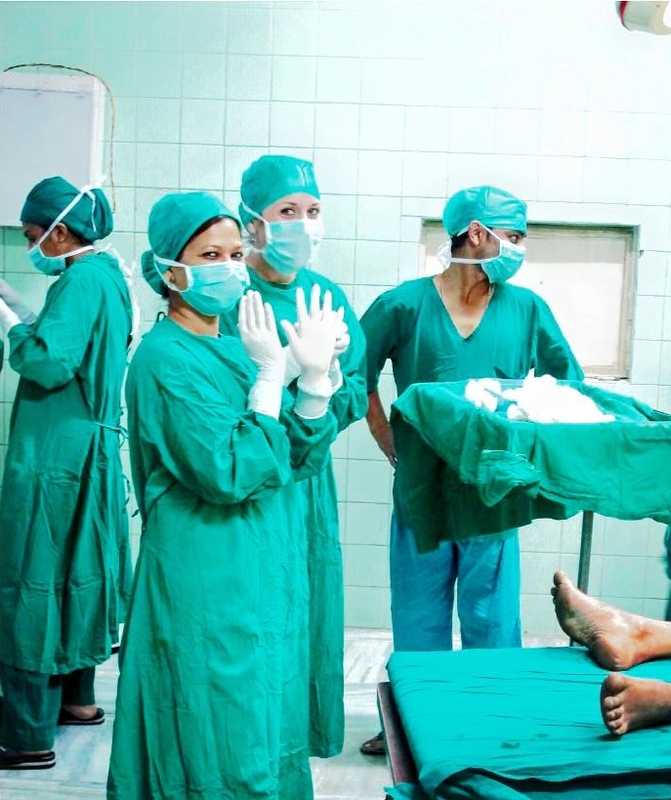 I used this new outlook during my second year to practice my newly-gained medical knowledge on yet another international elective, this time to India, where I assisted on my first surgeries, and learned what it was like to shoulder the heavy responsibility of someone else’s life. My clinical rotation years were spent mainly in New York City, with a brief trip out to California, where I would later settle down for residency. And as my classmates and I embarked on our paths to our various specialties, we found that we weren’t “less than” the US-trained physicians, something that people often tried to tell us. We were competent and capable and we had a spark and passion that couldn’t be dimmed. When someone asks me where I trained, I love to tell them about SGU. I tell them about why I went into medicine and how SGU kept me in medicine, and how my experiences there lit the spark that burst into the flames of my career in global health today. And then, when they ask me about what it was like going to a Caribbean medical school, I tell them about my colleagues – of my amazing, inspiring colleagues who are successful oncologists, obstetricians, rheumatologists, surgeons, radiologists, pediatricians, family medicine physicians, ER physicians, and more. These are people I call when I want advice – medical or otherwise – who know what it’s like to work against a stigma and to break that barrier. I am proud to be a graduate of St. George’s University, and to know what it’s like to swim against the current and come out on top. Learn more about the Keith B. Taylor Global Scholar’s Program at: http://www.sgu.edu/academic-programs/school-of-medicine/keith-b-taylor-global-scholars-program/. When I was young, my dad decided to teach me how to swim. Now, there are many ways to go about this. He could have enrolled me in swimming lessons. He could have bought some floaties and a life vest. He could have eased me into it by blowing bubbles and dangling my toes in the water. So which of these did he do? He took me down to the river and after splashing around a bit, took me by the waist and tossed me into the deep water. Water over my head. Water in my nose. Toes scraping gravel. My arms flailed. I pushed off the bottom. Sink or swim. Do or die. Succeed or fail. Choices are all around us. Every single day that goes by, you’re forced to make decisions. There are the easy choices, like what do you want for breakfast? What color shirt will you wear today? What radio station will you listen to on the way to work? But then there are choices that grasp at your heart, pulling it in every direction. We make lists of pros and cons, talk to our friends and family, and let the heaviness weigh on us day after day while we struggle to decide. We tread water. Valuable energy is expended while we stay in one place, thinking and deciding. When it comes to difficult decisions, I can’t promise you any way to make those choices easier. But I can tell you how to let them affect your life less. Stop overthinking and just act. You don’t need to have everything perfectly planned out. Most of the time, those perfectly laid plans will change and evolve along the way anyway. The most important step is that first one. So just jump. The water might be cold, it might be deep, and maybe you can’t see the bottom, but that’s okay. Trust your survival instinct. Nine times out of ten, your heart already knows the way.